If you haven't noticed, for most special occasions I often give gifts of books. So it's only fitting that for my daughter's 2nd birthday last week, my husband and I gave her a book. 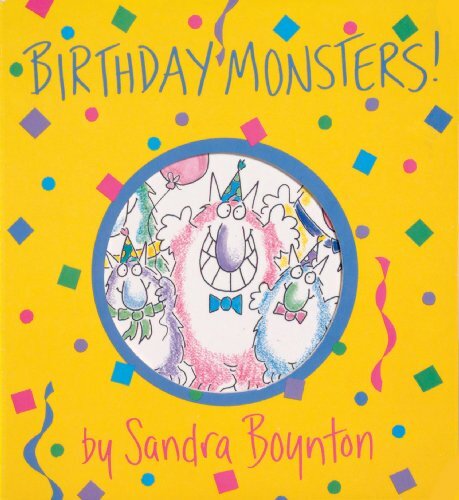 And of course it was a birthday book; Birthday Monsters by Sandra Boynton. My daughter LOVES Sandra Boynton books, so I thought why not add another to our collection. Birthday Monsters tells the story of 'Birthday Monsters' wrecking poor rhino's birthday. They wake him up early, take his presents and eat his cake before he can even blow out the candles. Don't worry, there is a happy ending. This is a great book for a toddler with a birthday!